In memory of the soldiers from Swanton, who laid down their lives in the civil war of 1861, the town, in accordance with the decision of a large majority of voters in town-meeting assembled, have erected a beautiful monument at a cost of about $2,000. The original appropriation was $1,500, and Hon. William H. Blake, one of the selectmen of the town, was authorized to make the purchase. A committee, consisting of Dr. G. M. Hall, Hon. 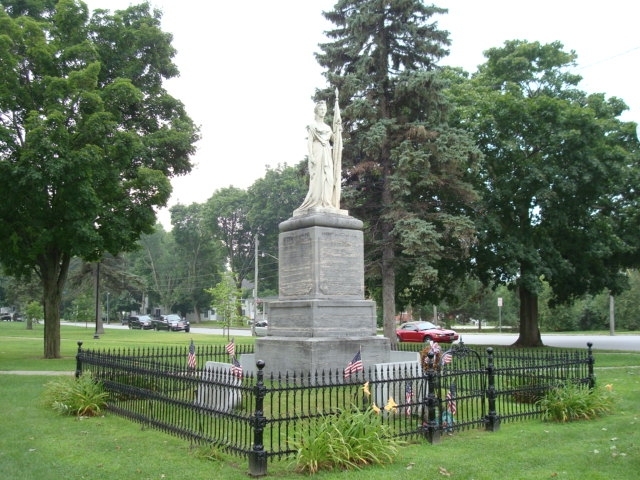 William H. Blake and C. W. Rich, was appointed by the town to accept and locate the monument, and the site was selected in the village park of Swanton Falls. The monument was placed in position in the fall of 1868. The design is a Grecian "Goddess of Liberty," figure and dress. She stands in a contemplative mood, subdued and sad, but at the same time one of exultation over the great results of the sacrifice for liberty. The base upon which the whole rests is a large block of marble taken from the quarries of Fisk and Barney, of the Isle La Motte, beautifully dressed. It is 5 feet, 6 inches square, and 2 feet, 6 inches high. Upon this base rests an upper base, taken from the same quarry, and made more ornamental, and upon this rests the die. The upper base is 4 feet, 3 inches square and 18 inches high. The die was taken from the Isle LaMotte polishing marble quarry, and is more highly wrought and elaborately finished. It measures 2 feet, 8 inches on either face, and is 4 feet high. Upon the sides of the die facing the south-east and west are sculptured the names of the 29 resident soldiers from Swanton who died in the service of the United States. Their names appear according to rank; also the number of the Regiment in which they were serving at the time of their death, whether killed upon the battle-field or died of wounds or disease in hospital, or otherwise, together with the name of battle-field or hospital and date of death. Upon the die rests the cap or capital. The same is wrought in Grecian moulding, is one foot thick, and is surmounted with the figure. The statue is of pure white marble from the Rutland quarries. The whole height of the monument is 20 feet, and the cost when the grading and fencing is completed, will be about $2,000. The work was executed by Daniel J. Perry, a young man, a native of Swanton. This was his first effort of this magnitude, and is a success beyond even the most sanguine expectations of his friends. He was occupied upon the work about a year and a half, with other workmen to assist him on the bases and die, etc. This work does great credit both to the kindly and patriotic feeling of the people of Swanton, and in this respect the town stands alone among towns of the county. Source: Barney, George and Rev. John Perry; "The History of Swanton, Vermont," contained in volume 4 of Abbe Hemenway's Gazetteer of Vermont, published in 1882, pp 1061-1069. Photograph courtesy of Erick Bush.